Take care that you be not ensnared to follow them, after they have been destroyed before you, and that you do not inquire about their gods, saying, ‘How did these nations serve their gods?—that I also may do the same.’ You shall not worship the Lord your God in that way, for every abominable thing that the Lord hates they have done for their gods, for they even burn their sons and their daughters in the fire to their gods. Let me clear some things up first. I’m not judging anyone who is participating; I only hope that those who are feeling indecisive about this, would find their answer. I pray that the shepherds would be more aware of the paths along which they are leading their sheep and that those called out to be gatekeepers and watchmen would stand guard and protect the flock. The Holi (aka Color run) Hindu festival is celebrated at the beginning of spring each year. The name Holi (which means burning) originated from the name Holika, the demon king’s evil sister. She, Holika, helped her brother reign by killing his son/ her nephew. Legend says that the son of the demon refused to worship him and instead worshiped Vishnu. So Holika ended this by putting the boy on her lap and sitting in a fire so he would die. She thought she would be untouched because her super power was that fire could not burn her- but her plan backfired and she sizzled to death. 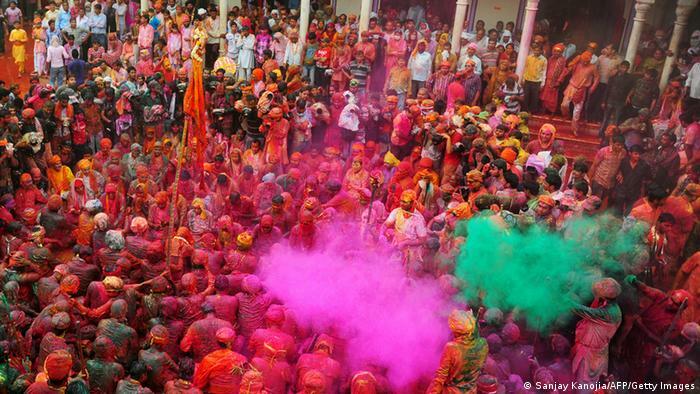 In India, they throw colored powders in the air over the people as a symbolic remembrance of this demon sister Holika (Holi) and the beginning of spring. On this day many others worship Kaamadeva, the love god. There are a few other variations and myths (and some have changed over the years): to some it was a time when the moon god was worshipped- here’s another one – Krishna wasn’t happy with his skin color so his mother told him to color his lovers skin so her complexion would change and from there, they started the color festival. Don’t ask me to explain that one, but if you want to find out more, see the links below. Why are we turning to pagan religions, worldly traditions, new age ideas and witchcraft to find new ways to play church? Last year, the fad was the Harlem shake. I embarrassingly watched my children’s youth group’s you tubes as they gyrated in their underwear wearing large animal head pieces. I cringed! Then I saw pastors and churches joining in. The year before this it was the Circle maker. Why are we going to pagan religions, worldly traditions, new age and witchcraft to find new ways to play church? I wonder how many pagan practices we unknowingly have within our churches, traditions and holidays. It’s our job to stop it when it begins to sneak into our churches. What are we teaching the next generation by doing this? The Color run sounds like a lot of fun, no doubt about that- but I ask you, as Christians and Church members- When are we finally going to put the brakes on bringing the world and pagan practices into our churches? Ephraim, he hath mixed himself among the people; Ephraim is a cake not turned– as worthless as a half baked cake. Reading through Hindu sites I found mixed emotions on how they feel about us celebrating their tradition. Some are deeply offended and some are happy they can share their Hindu and Hare Krishna religion with us- yes, they see it as an open door to share their faith. God wants us to be NEW. A new Creations. He gave each one of us an amazing mind- surely we can come up with our own new ways of worship and fellowship. I am sure we can think up new creative ways of fellowship without copying pagan religions. We are not to be conformed to this world, but TRANSFORMED by the renewing of our mind. I just thought of something!!!!!! Joshua at Jericho and Gehazi with the Shumanite were both supposed to run/walk without a word spoken, okay maybe it’s boring – but think of how much we’d have to say when we reached the end. And how about Elijah’s supernatural run when he outran the chariots, there was a terrible storm coming. So I’m thinking everyone has to run like the wind and anyone who is slow gets soaked. Lol– but you see, you can get creative, amen? “When the Lord your God goes ahead of you and destroys the nations and you drive them out and live in their land, do not fall into the trap of following their customs and worshiping their gods. Do not inquire about their gods, saying, ‘How do these nations worship their gods? I want to follow their example.’ You must not worship the Lord your God the way the other nations worship their gods, for they perform for their gods every detestable act that the Lord hates. They even burn their sons and daughters as sacrifices to their gods.“So be careful to obey all the commands I give you. You must not add anything to them or subtract anything from them. You have put pagan symbols on your doorposts and behind your doors. You have left me and climbed into bed with these detestable gods. You have committed yourselves to them. You love to look at their naked bodies Isaiah 57:8. Bring long life:Those who control their tongue will have a long life; opening your mouth can ruin everything Proverbs 13:3. Bring Blessings – Issac and Jacob, Abraham, Eli and Hannah, Joseph’s Sons, Jacob over his sons…..
Distort the truth Job 38:2 Who is this that darkeneth counsel by words without knowledge? Bring health Proverbs 16:24 Pleasant words are as an honeycomb, sweet to the soul, and health to the bones. What have your words done today? Have they brought life? Hurt? Wisdom?Anger? Death? Destruction? Praise? Encouragement? Help? Foolishness? Gossip? Deception? Faith? Hope? Healing? I was surfing through you tube and I found a video of a high school reunion from my school. Each person was talking into the camera having fun with each of their friends. The camera went from person to person as everyone said hello. One person mentioned that she thought it was funny that everyone at the reunion “knew me, but none of them ever said a word to me in high school”, then another man with sad eyes just looked in the camera without a word. You could tell he was holding back tears and he only held up his name card so the people watching the video would know who he was. I’m still sad thinking about it. Knowing some of the people I grew up with – and I’m no better- I can easily see people ignored or made fun off today – even after all these years. I mentioned to a friend that I ran into an old classmate and before I could continue, she remarked “wasn’t she a nerd”. I was silent, are we grown up and still doing this garbage? Do people really need to have lifetime tags on them? Growing up in a Christian school, you would think we would treat all people as Jesus did, but we were far from it. To be Jesus like, we need to step outside that “old man” box and show the “new man”. Use words of kindness and encouragement. Say hello to others, don’t just think about yourself – but stop to consider others. Ask the Lord for a great love for other people – you’ll be surprised. 1- Devote yourself to prayer: We should be just as persistent in our prayer life as we are in our outward “service”: God has given us His Son – the greatest gift- and now we can go before the throne of God in prayer. So I ask you- are you using this gift? Have you put it to the side? Have you taken full advantage of this priceless gift of prayer? The Lord God waits for you, He has prepared a place before the throne for you- Use this gift! 2- Open up the Bible and apply it! Study and Follow God’s Ways in His Word. God has given us His Word- are you using this gift? Have you gotten lazy? Don’t you know that all Gods promises are written there for you? It leads you along the path to Salvation. It warns you if you happen to step off the path, it is a lamp to your feet and light for your way. What have you done with this gift? When you think about it, what good is all our service if we aren’t walking with the Lord? What good are all our books, blogs, studies, teaching, videos, sermons, events – if we are far from the Lord and walking with the World and not the Word? What good are our talents if we are using them according to our own ways – because we haven’t stopped long enough to hear God’s leading? What good is all our teaching if our heart is far from God? What good is all your hospitality if you are not walking along God’s path because you don’t know His path? You may be saying – well they had an investment-and to that I say- aren’t prayers equally investing, if not more than anything else? Don’t they reap reward? Surely they heal the sick and bring people to Christ, protect workers from evil and strengthen the weak. Doesn’t the word say- that those who put much study and time into the scriptures, get much out – and in Ezra, the Lord blessed Him because of His study of the scriptures. Doesn’t the book of Isaiah tell us that God’s word always accomplishes everything it is sent out to do and it always succeeds!!! Show me an investment like that. Then I said, Lord, why did you give the third man so little? and the Lord told me that He gave him little because He knew he wouldn’t do much work. He knew He wasn’t going to do much with it so He gave him little to do- but He still expected it to be done. Unfortunately the lazy fearful man did nothing with what He had- it reminds me of the Parable of the Great feast. One man showed up without his wedding clothes – he didn’t even bother to get dressed- how disrepectful, not only that, but when asked why, he didn’t even bother to answer. It’s a picture of pure laziness and disrespect. In other words, there was no fear of God. Sure, the man said he feared him, but if true, would he have so boldly spoken out to him on what a ruthless inconsiderate man his master was? The master called him wicked and lazy. Talk about lazy… that’s what this generation is creating with all the electronics. Parents are wasting their kids talents away on video games, computers, and television shows. Turn it off! Saving Souls!!! 1 Thess. 2:19-20 After all, what gives us hope and joy, and what will be our proud reward and crown as we stand before our Lord Jesus when he returns? It is you! Yes, you are our pride and joy. Helping the least of His followers – you will surely be rewarded!!! Help others. And we do all this – not to seek a reward, although that is wonderful, but we do all this to please our King and our Lord- helping the sick, visiting those in prison, helping the lost find their way, taking care of the orphans, the widows, the homeless, the downcast, the hungry, and the thirsty. I’ve rambled on and now I’m off topic, so maybe, if I find it interesting enough, Ill post the rest of this power of words study on another post. It’s much to long to post here. Peace! And may the God of peace SOON crush that annoying serpent under your feet as you step out in Victory for Jesus Christ, the Savior of the Whole World .May the Grace of the Lord Jesus be with you. The Love test. Are you a Clanging cymbol?